I had the good fortune to join the crew of the NOAA P-3 “hurricane hunter” plane that flew into Harvey on 25 Aug 2017 shortly before it made landfall in Texas. We made six pairs of eyewall penetrations. The maximum surface level winds continued to grow with each successive one as we witnessed Harvey’s rapid intensification from a Cat 2 to Cat 4 hurricane. We were able to capture much of that dynamic transition, using continuous radar and radiometer remote sensing measurements plus frequent in situ measurements by dropsondes. These will be used to help calibrate and validate our measurements by CYGNSS, which have been ongoing since Harvey first started to develop earlier in the week. Following is a description of my experience that day. Pre-flight briefing about an hour before take-off at 10:00 EDT. The flight out to Harvey started ominously, with a detailed safety briefing before take-off for first timers like myself about things like the difference between what to do if we have to ditch in the ocean with more than 3 minutes of warning vs. less. The hurricane hunters have been flying for decades and have never had to ditch, so this gives you some idea of how thorough and detail oriented the crew is. 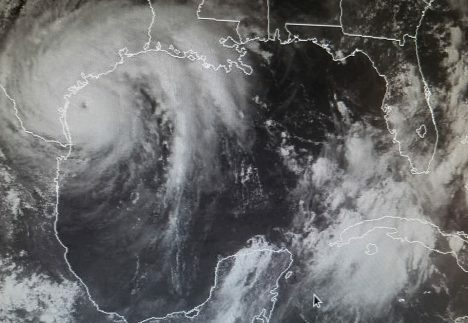 After the safety briefing, the flight director mustered the full crew to discuss some last minute mission logistics and concluded with this: “Harvey is currently a Cat 2 hurricane and is expected to undergo RI (rapid intensification) while we are in the air, then head for landfall tonight near a major population center. Days like today are why we are here. Now let’s go do our jobs.” We were “wheels up” 15 minutes later at 10:00 EDT. 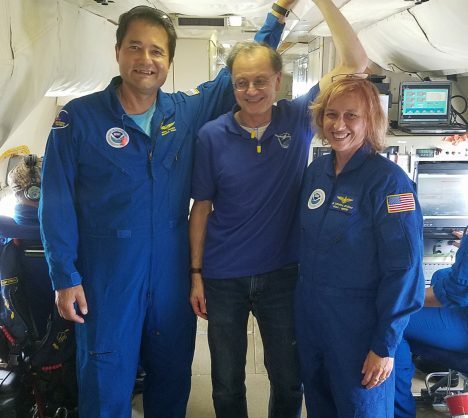 Me with two of the CYGNSS science team members, Dr. Paul Chang (left) and Dr. Zorana Jelenak (right), who were airborne mission scientists on the flight. The two hour ferry flight from Florida across the Gulf of Mexico wasn’t much different from any commercial flight. But as we approached Harvey’s outer rain bands, things changed. Everyone strapped into their seat with four-point restraints across their chest and lap. Headsets were on and a steady chatter began between the flight director and the crew operating the various remote sensing equipment and dropsondes. A real time display from one of the radars showed the rain distribution within a 200 mile radius around us. Heavy rain spiraled out in bands from a bright circle to the south of us at the edge of the image. 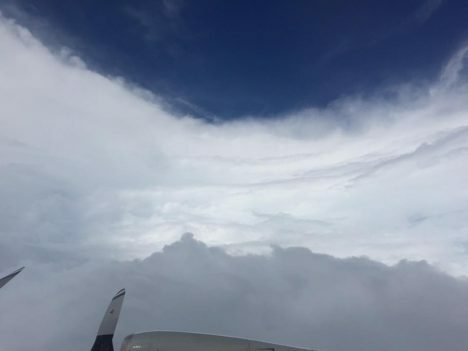 The plane banked to the south and headed toward that circle – the eyewall. The flight became more turbulent as we approached it. Occasionally, the bottom would drop out from under the plane and I would find myself lifted up off my seat, held down only by the straps. The flight director called it “sporty plus”. The worst of the turbulence occurred out in the spiral rain bands. Flying conditions became smoother as we approached the eyewall, but the skies grew progressively darker and, flying at 8000’ altitude and well below the freezing level, heavy rain streaked across the windows. A second real time display, from a microwave radiometer, showed the surface wind speed directly below the plane. It had been increasing steadily since we headed south into the inner core of the storm. Then we entered the eyewall. The rain became even more intense, the surface wind spiked above 51 m/s (~115 mph), and the skies darkened even more. Then, in the next minute, the interior of the plane grew suddenly brighter and the turbulence disappeared. Looking out the window, I could see the ocean below us and blue skies above. The radiometer showed that the surface wind speed had dropped below 10 m/s and the radar image drew a bright circle of intense rain all around us with nothing in the middle. We were in the eye of Harvey. A visible image taken by the GOES satellite at 15:15 CDT as we were flying through the eye. Looking out the window at 8000’ in the eye of Harvey (photo by Brad Klotz). Over the next few hours, we conducted a total of six pairs of eyewall penetrations, each time circling to a new azimuth angle before entering the eye again in order to map out as complete an image of the storm structure as possible. With each successive penetration, the maximum winds encountered in the eyewall kept growing. We were experiencing firsthand Harvey’s rapid intensification phase as it strengthened all around us. Screen captures of the flight line of the mission: (top) As we were ferrying out to the storm, when we got our first look at the eye (toward the south) with the airplane’s radar. (next) Starting our first (north-to-south) eyewall penetration. (next) Lining up for our second (east-to-west) penetration. (bottom) After our last (sixth) penetration, as we prepare to ferry back to FL. Our measurements were radioed back to the National Hurricane Center in Miami as they were made, to be fed into their forecast models and to be forwarded to the media and emergency responders to let them know what Harvey had become and to help them prepare for what was headed toward Texas. Finally, as our fuel began to run low, we left the storm and returned back across the Gulf to our base at the NOAA Airborne Operations Center in Lakeland, FL. Minutes before landing, we received confirmation from the NHC that Harvey had been officially classified as a Cat 4 hurricane. The P-3 right after we landed. Lots of hurricane remote sensors are visible on the wing and underside of the fuselage. She took very good care of us. This entry was posted on Sunday, August 27th, 2017 at 2:04 pm and is filed under Cyclone Global Navigation Satellite System (CYGNSS), Uncategorized. You can follow any responses to this entry through the RSS 2.0 feed. Both comments and pings are currently closed. Your mom passed along the address for your blog post. Sounds like it was a blast!! Wow! Just reading this now. My stomach is lurching just reading this. You’ve got a lot of guts going up into that storm. Fascinating!